Bacon sizzles in the pan resting over the fire when I arrive at The Studio, a makeshift campsite at the base of Mount Hood, around 8 a.m. B-Mac and Tim McChesney are up early, cooking breakfast while Magnus Graner lounges in a hammock with his nose in a book. Karl Fostvedt hasn't made it out of his tent yet. Today, these four woods-dwellers are living out another morning of the dream: bumming in the woods and skiing all summer long. 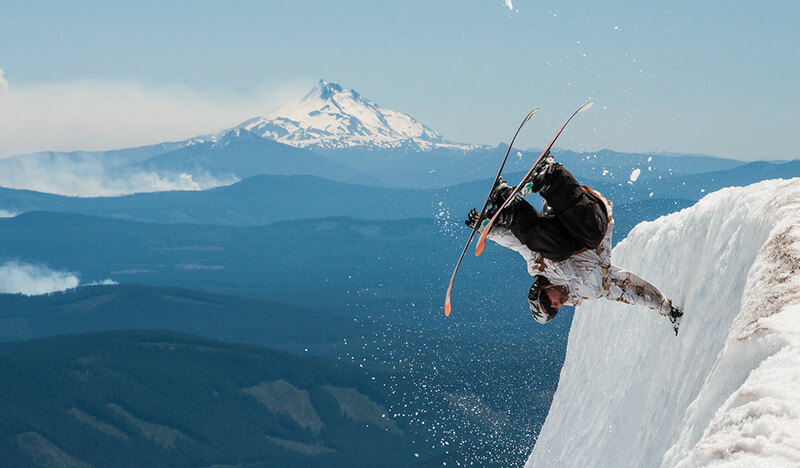 Every summer, skiers and snowboarders migrate by the thousands from across North America and internationally to spend the summer at Timberline Ski Area on Mount Hood. The ski campers come and go, as do the big-name pros, but the real die-hards—a fringe group of skiers and riders whose lives revolve around year-round shredding—stay from June until September, making it work one way or another. There are many ways you can pull this off: score a job on the mountain, hopefully one that includes a free summer pass, and snag some affordable housing in Government Camp (good luck with that). Alternatively, forget the job, forget the rent, and invest your savings in a summer pass and a tent with a good rainfly. Alex "Shuggs" Dorzynski is a master of the latter approach. The Tahoe-based 25-year-old with a shaggy mane has spent eight summers camping at Mount Hood since 2005, earning a reputation as one of the mountain's most persistent itinerants. 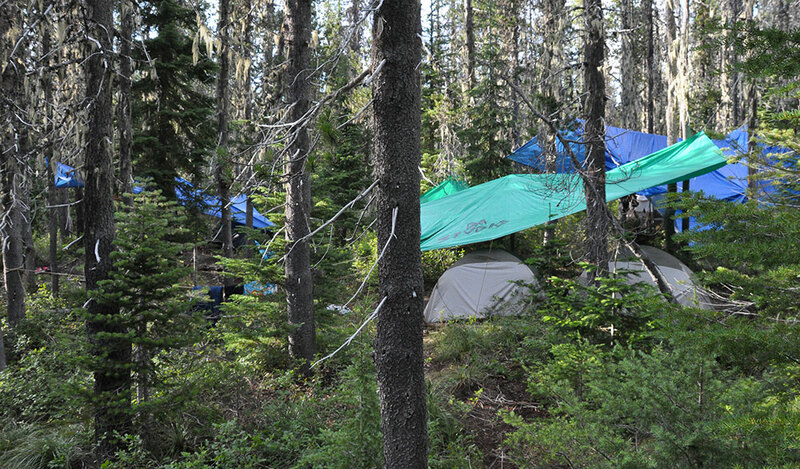 Together with partner-in-crime Zach Steele, Shuggs established a tree-fort encampment known as the Ewok Village, which lasted three seasons before its eventual detection and destruction by the U.S. Forest Service. "It's the epitome of ski bumming," says Shuggs, who would hustle tall tees, bandanas, and ski gear to young racers and campers to earn enough cash to cover his minimal expenses. A liberal dig-to-ride policy let him hit the park in exchange for a few hours of work per week. "You don't need a big bankroll to make it happen. It's maybe not the most lavish lifestyle, but it keeps a smile on your face." The Studio, home to B-Mac, Magnus, and company, is located about a mile down the road from the former location of the Ewok Village. The campsite doesn't have Ewok's tree house architecture, nor the bohemian reputation of campsites like the Airstrip or the Graveyard, but it does feature a fully functioning editing studio in the woods. Okay, the editing studio isn't much more than a plastic table sheltered by a huge tarp, supplied with power by a small generator. But the campsite is more than sufficient for B-Mac and Magnus to spend evenings here working on their personal video segments from the past season. The two young Swedes are members of an influential Scandinavian ski crew called The Bunch, and they have achieved something like boy-band popularity in the insular world of underground film skiing. Both invested in expensive Timberline summer passes, and they are now focused on, as Magnus says, "trying to live as cheap as possible, in order to ski as much as possible." After wolving down bacon-and-egg breakfast sandwiches, The Studio's residents rally for the hill. An action-packed day in the Windell's Camp ensues, but the best part of the day might be jumping into the spring-fed, 34-degree Little Crater Lake, the campsite's best way to stay clean. Hobo dinners over the fire, a mix of veggies and ground sausage seasoned and wrapped in aluminum foil, round out the evening. 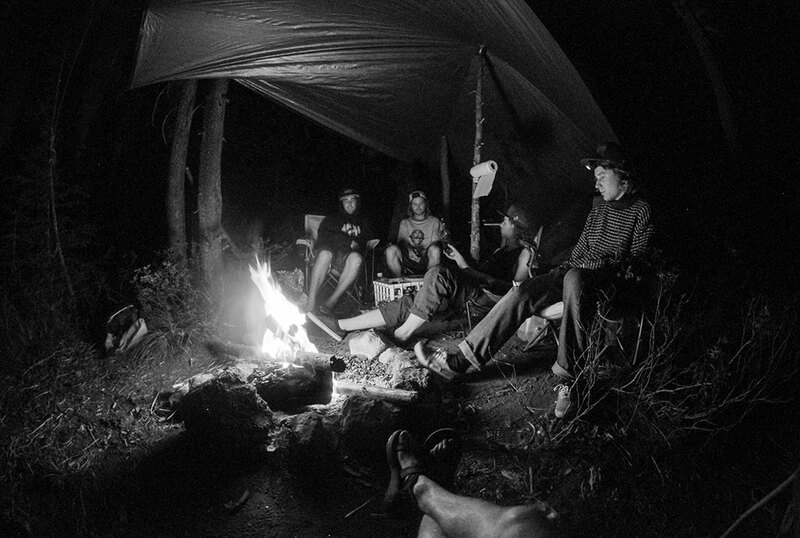 When the shadows creep in around the edges of the campfire, the guys hit the sack and get ready to ski and camp all over again tomorrow. Disclaimer: Camping in the woods is not for everyone, but it's a good character builder, so buck up and try it. 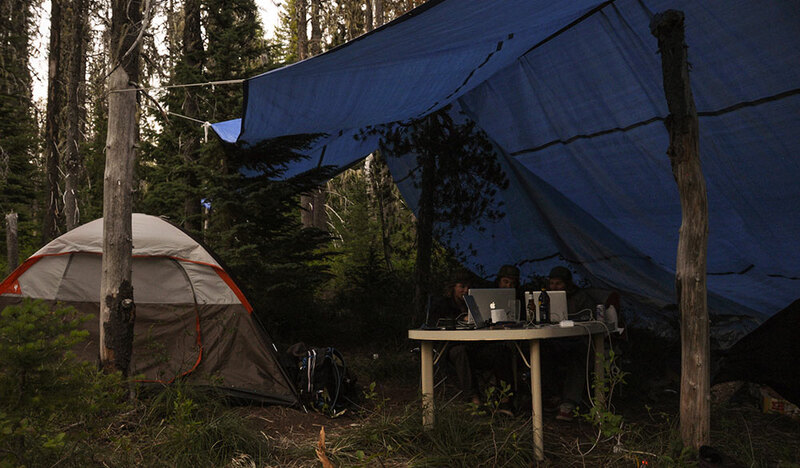 Staying for longer than 14 days in one place in the Mount Hood National Forest is illegal. If you do choose to camp here, be respectful of your surroundings. Campers who turn into a nuisance aren't well received by either the local populace or the local sheriff. Don't blow the vibe for everyone else.